The Montessori Method of education is named after Dr. Maria Montessori, an Italian physician and educator who opened the first Montessori school in 1907. Dr. Montessori theorized that all children are born intelligent but learn in different ways and progress at their own pace. She studied preschool, kindergarten and elementary school age children extensively and noticed that young children absorb knowledge more easily than older children and at the age of 2½, the learning process begins rapidly. Over time, she developed and tested her theories and they have now been in practice in thousands of schools around the world for over 100 years. The Montessori Method encourages children to perform self-directed learning at their own pace. The school encourages the development of the whole child, allowing for an orderly, calm and peaceful approach to learning. Throughout the early childhood education program, the child gains confidence in making choices and becomes aware of their surroundings. Because of this process, the child develops mutual respect and helpfulness, a feeling of self worth, an appreciation of others and many other qualities that enrich the child's life. Children primarily work with innovative hands-on learning materials instead of textbooks. They work on their own or collaborate in small groups and learn to study in the way that is most effective for them. Within this system, students are encouraged to truly understand the materials rather than simply memorizing and repeating words and phrases. Montessori classrooms provide an atmosphere that is pleasant, attractive and geared towards the children. It is divided into logical areas for each of the key curriculum areas. 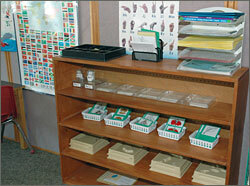 Learning materials are placed on easily accessible tables and open shelves that are sized appropriately for small children. Each classroom has children spanning three age levels with the class staying together for three years. In this model, the older children help teach the younger children, which reinforces the concepts for the older children. The younger children see the older children as role models and are encouraged to learn so they can "do what the big kids do". The children stay with the same teacher all three years. This allows the teacher to develop close relationships with the children, allows them to know each child's learning style very well and encourages a strong sense of community among the children. 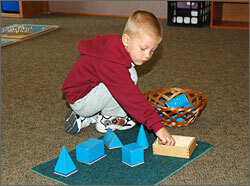 Montessori uses innovative, hands-on learning materials that are often self- correcting. This enables children to realize that mistakes are an opportunity for learning. They also deepen the student's understanding of a concept and allow them the joy of discovering something by themselves. Recent research studying brain development in young children supports many of the theories behind the Montessori Method. Students have a smooth transition to traditional classrooms after the Montessori experience and the values they have gained serve them well in high school, college and in their lives as adults. Interested in learning more? Visit our school and see the Montessori Method in action in our classrooms.